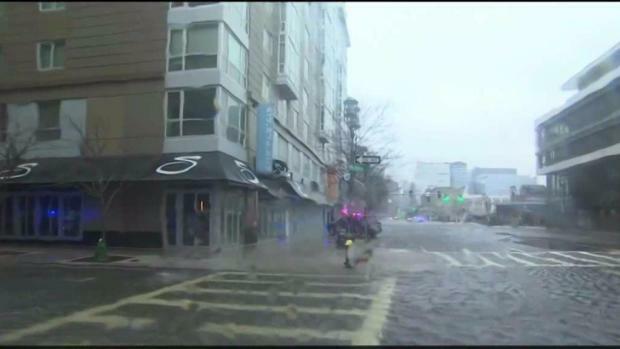 Flooding has been a problem in coastal Boston during the nor'easter. With the March nor'easter moving through Boston Friday, several areas near Boston Harbor are experiencing flooding. Streets in the area had become unpassable because of the rain. The Aquarium stop on the MBTA Blue line had to be closed as water poured into the station. "This is terrible," said MBTA rider Alex Alchimio. "Three trains trying to get to the aquarium and they are closed for the day." Workers at Boston Harbor tours were also gearing up for the storm today. Their corporate offices are still making repairs from the flooding in the area from January. Waves were sent high up on to Boston's Harborwalk during Friday's nor'easter. "I think we are going to hunker down for awhile anyway. We need to watch the boats," said Jean Sullivan from Boston Harbor Cruises. Officials said they planned to monitor the storm throughout its duration and were taking proactive steps to deal with flooding. 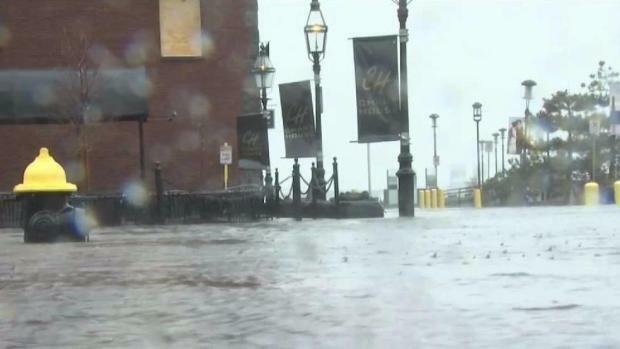 Authorities were encouraging residents to be mindful of the storm's potential impact and urged residents along the Boston Harbor and coastline to evacuate after a storm Jan. 4 caused massive flooding. "As we saw with the coastal flooding in the Seaport in January, there is a need to proactively plan for our changing climate, which is why we're integrating climate resilience into all aspects of city planning moving forward, beginning with a Climate Ready project in South Boston," Mayor Marty Walsh said. On Thursday, the Boston Water and Sewer Commission cleaned out low-lying areas of debris that could clog catch basins and restrict underground water flow. Boston police also put barriers in places that are most affected by flooding and planned to redirect traffic as needed. Massachusetts Emergency Managment Agency director Kurt Schwartz thanks emergency workers for response during nor'easter. "Flood barriers is one solution. Other folks are elevating utilities and making sure those aren't vulnerable to flooding, but we need to step away from thinking just parcel by parcel and really think about citywide resiliency," said Jill Valdes Horwood, director of policy at Boston Harbor Now. The Public Works Department planned to have loaders available to remove debris after the storm. Baker and other officials held a news conference Thursday where he announced that he signed an order to activate up to 200 members of the National Guard to work with state and local officials in the coming days. "Some roads in downtown Boston and roads along the coast that usually have flooding issues will likely become impassable for some time." Baker said. "For example, certain sections of the Seaport District, the North End, and Morrisey Blvd. will likely flood for some time on Friday." 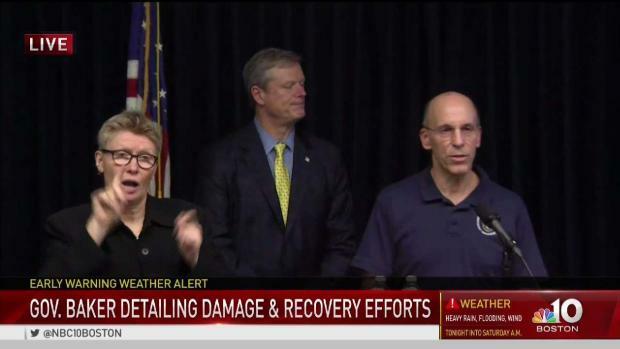 Baker cautioned that the expected storm could be worse than the recent storm in January. "The coastal flooding warnings for this storm are forecast to be more severe than the storm that hit the Commonwealth on Jan. 4." Baker said. 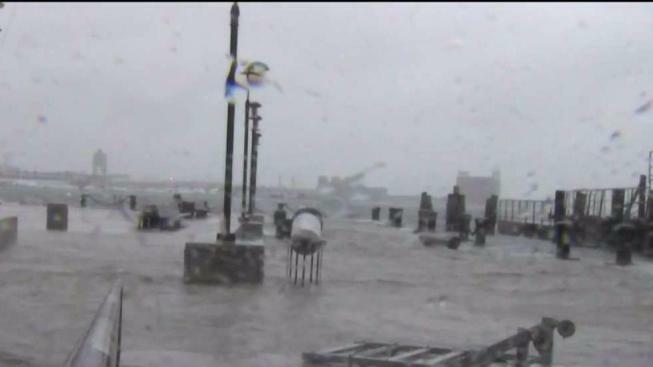 "The combination of storm surge and astronomically high tides means that a significant amount of that water will not recede between the high tide times of 11:30 a.m. and p.m. on Friday." Many eyes in Boston were on public safety as strong nor'easter moves through town. Police and city officials monitor the storms path. Just after 10 a.m., state police tweeted that Morrissey Boulevard from the University of Massachusetts Boston to Freeport Street and exit 14 to Morrissey from Interstate 93 in Dorchester was closed due to flooding.